What Is Extrinsic Motivation and How Does It Work? 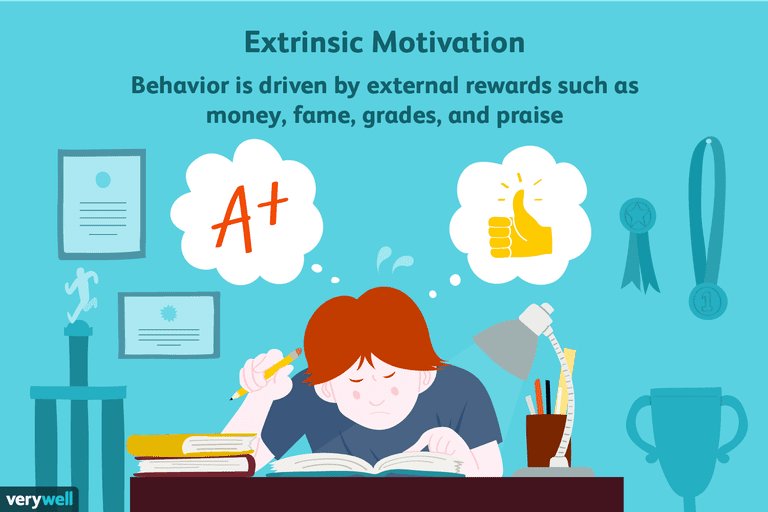 Extrinsic motivation refers to behavior that is driven by external rewards such as money, fame, grades, and praise. This type of motivation arises from outside the individual, as opposed to intrinsic motivation, which originates inside of the individual. Think about your own motivation for reading this article. Are you trying to learn the material so that you can get a good grade in your psychology class? This means that you are studying the material to gain external reinforcement (getting a good grade), which means that your behavior is extrinsically motivated. If, on the other hand, you are reading this because you are interested in learning more about human behavior, then that would be an example of intrinsic motivation. People who are extrinsically motivated will continue to perform an action even though the task might not be in and of itself rewarding. A person who works in a manufacturing position, for example, might perform a number of routine tasks that are not enjoyable. Because this person is receiving an extrinsic reward (a paycheck) for completing these tasks, he or she will feel motivated to perform them. When you want to get someone to do something, such as getting your kids to do their homework, what is the best way to motivate them? Many people might start by offering some type of reward like a special treat or toy. This is a great example of extrinsic motivation since the behavior is motivated by a desire to gain an external reward. Unlike intrinsic motivation, which arises from within the individual, extrinsic motivation is focused purely on outside rewards. Extrinsic motivation is usually defined as our tendency to engage in activities in order to gain some type of known, external reward. It is important to note that these rewards can be either tangible or psychological in nature. Money and trophies are two common types of tangible rewards. People engage in activities that they might normally not find terribly enjoyable or rewarding in order to earn a wage. Athletes often engage in strenuous and difficult training sessions in order to be able to compete in sporting events in order to win trophies and awards. Psychological forms of extrinsic motivation can include praise and public acclaim. A child might clean her room in order to receive positive praise from her parents. An actor might perform in a role in order to obtain attention and acclaim from his audience. In both of these examples, while the reward is not physical or tangible, it is a type of motivating reward that is external to the actual process of participating in the event. How Effective Is Extrinsic Motivation? So just how well do extrinsic rewards work for increasing motivation? This type of motivation can be highly effective. Just look at all of the examples in your own life of things that you do in order to gain some type of external reward. You might shop with a store loyalty card in order to gain points, discounts, and prizes. You might toil away performing tasks at work that you dislike in order to keep getting a steady paycheck. You might even use a particular type of credit card in order to receive airline miles. All of these are examples of performing specific behaviors in order to obtain an external reward. While offering rewards can increase motivation in some cases, researchers have also found that this is not always the case. In fact, offering excessive rewards can actually lead to a decrease in intrinsic motivation. The tendency of extrinsic motivation to interfere with intrinsic motivation is known as the overjustification effect. This involves a decrease in intrinsically motivated behaviors after the behavior is extrinsically rewarded and the reinforcement is subsequently discontinued. In a classic experiment by Lepper, Greene, & Nisbett, children were rewarded lavishly for drawing with felt-tip pens, an activity that they had previously enjoyed doing on their own during play time. When the children were later offered the chance to play with the pens during play time, the children who had been rewarded for using them previously showed little interest in playing with the pens again. The kids who had not been rewarded, however, continued to play with the pens. Why would rewarding an already intrinsically rewarding behavior lead to this sudden disinterest? One reason is that people tend to analyze their own motivations for engaging in an activity. Once they have been externally rewarded for performing an action, they assign too much importance to the role of the reinforcement in their behavior. Another possible reason is that activities that initially feel like play or fun can be transformed into work or obligations when tied to an external reward. Extrinsic rewards can be an important tool in motivating behavior, but experts warn that they should be used with caution, especially with children. Extrinsic motivators are best applied in situations where people have little initial interest in performing the activity or in cases where basic skills are lacking, but these rewards should be kept small and should be tied directly to performing a specific behavior. Once some intrinsic interest has been generated and some essential skills have been established, the external motivators should be slowly phased out. Extrinsic motivation can exert a powerful influence on human behavior, but as research on the overjustification effect shows, it has its limits. You might also find it helpful to consider whether you are intrinsically or extrinsically motivated when engaging in certain activities. Are you looking forward to your workout at the gym because you have a bet with a friend about who can lose the most weight? Then you are extrinsically motivated. If, on the other hand, you are eager to work out because you find the activity fun and satisfying, then you are intrinsically motivated. Extrinsic motivation is not a bad thing. External rewards can be useful and effective tool for getting people to stay motivated and on task. This can be particularly important when people need to complete something that they find difficult or uninteresting, such as a boring homework assignment or a tedious work-related project. Brown, L. V. (2007). Psychology of motivation. New York: Nova Publishers. Lepper, MR & Greene, D. The Hidden Costs of Reward: New Perspectives on the Psychology of Human Motivation. London: Psychology Press; 2015.